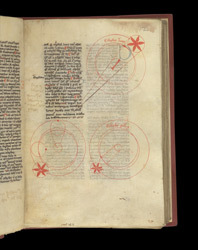 The two right-hand diagrams on this page illustrate how eclipses occur. The earth is in the centre and the sun in the outer orbit. In the upper diagram, labelled 'Eclipse of the moon', the earth casts its shadow on the moon, while in the diagram below, labelled 'Eclipse of the sun', the moon casts its shadow on the earth.